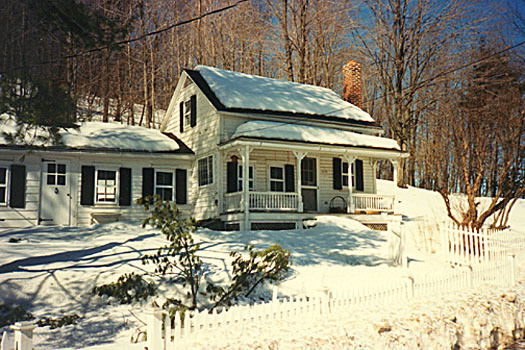 The above photo shows his house at Phudd Bottom, near Harlemville, where he lived with Phyllis Playter from 1930 until they left for England in 1934. The map displays initially a satellite image at a moderate zoom level with labelled routes. Clicking the "Ter" button produces a relief map showing that there was, in accordance with John Cowper's constant desire, a hill behind the house which he would climb almost every day.  leave the Taconic State Parkway at the route 217 Philmont exit but instead of taking Route 217 west to Philmont, take immediately County Road 21C east. Stay on Co Rd 21C to traverse Harlemville, then take the first right south on Harlemville Road, the house is on the right after 350m. My thanks to Pat Quigley for his assistance in relating reality to the maps! The four years he spent there with Phyllis were probably the most felicitous time in his life, when he wrote two important books, as well as his Autobiography. There are many subjects that need examining, but for the time being I have concentrated on the importance for John Cowper of living in an area where he felt a certain influence emanating from the Indian culture, and more particularly exerted by the first inhabitants of the region, the Mohawks. So, you will find here a modest study of the strange similiarities which seem to have existed between the Amerindians' rites and culture, and what Powys felt and made of them, which determined his way of life from then on.